Precious cargo The two volumes come carefully packaged along with the stand in a robust custom-made wooden crate to preserve and protect them. Attention: total weight is 59 kg (130 lb)! 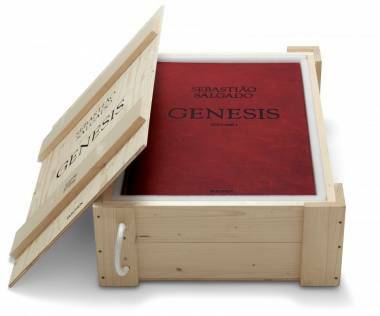 The Art Edition comes with a book stand designed by Tadao Ando The GENESIS book stand was conceived by Japanese architect Tadao Ando, the only living person to have won architecture’s four most prestigious prizes. Ando’s simple and innovative design consists of two “twin” pieces of wood, bound together with leather, into which a third piece of wood can be slotted to form a sturdy, elegant display. 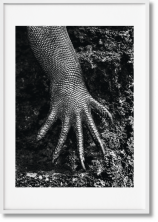 Fine print GENESIS is printed on a traditional coated 250 gsm art paper from the German paper mill Scheufelen that is no longer available on the market and was produced specially for TASCHEN. The black and white pictures are reproduced in a four-color separation process, with two blacks and two shades of grey; the density of the blacks achieved rivals that of the finest silver gelatin prints. 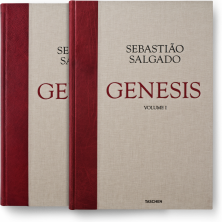 GENESIS was printed and bound in an Italian workshop utilizing traditional craftsmanship techniques that are unique worldwide in this field, using Italian Cialinen fabric for the cover. 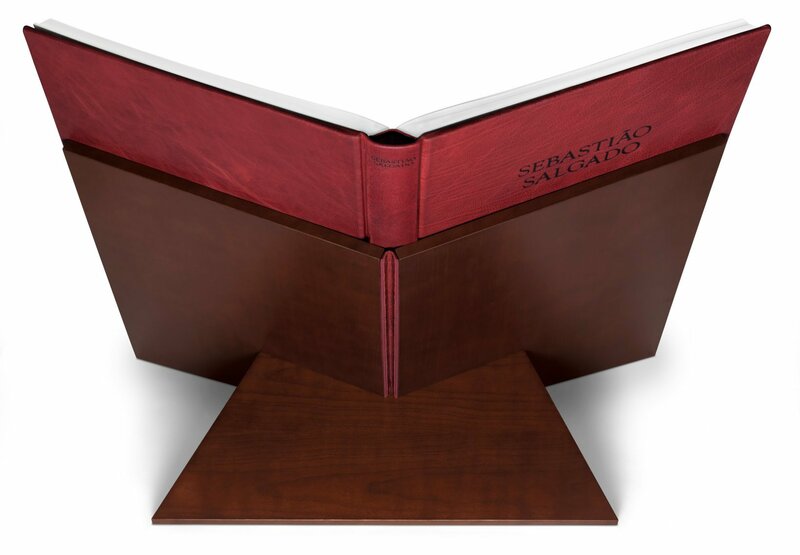 The Ando book stand was hand made in Spain, and the leather originates from Britain. 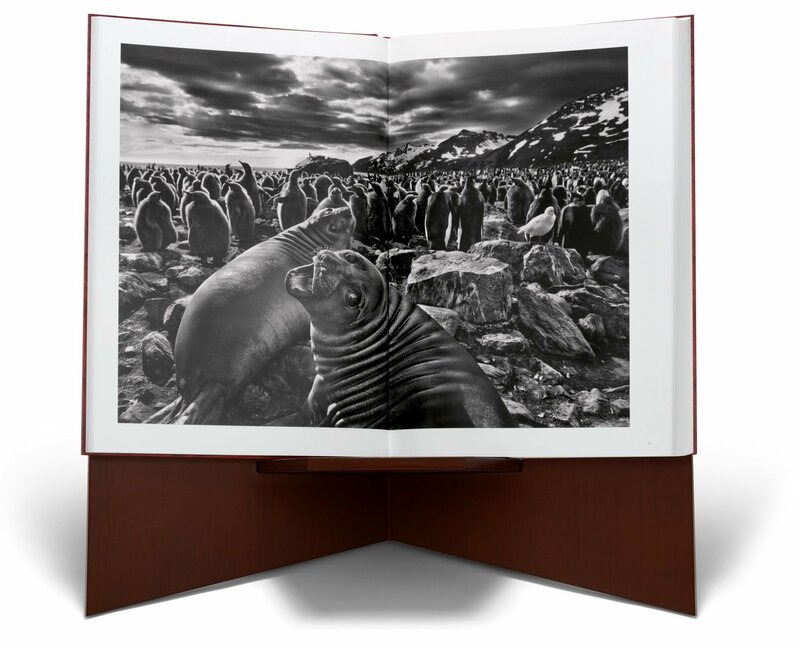 Sebastião Salgado’s spectacular SUMO-sized, leather-bound Genesis is conceived as a monumental “love letter to the planet,” celebrating the Earth in its most pristine and precious state. In characteristic monochrome, Salgado captures sublime scenes of nature, animals, and indigenous peoples that have so far escaped the imprint of the modern world. 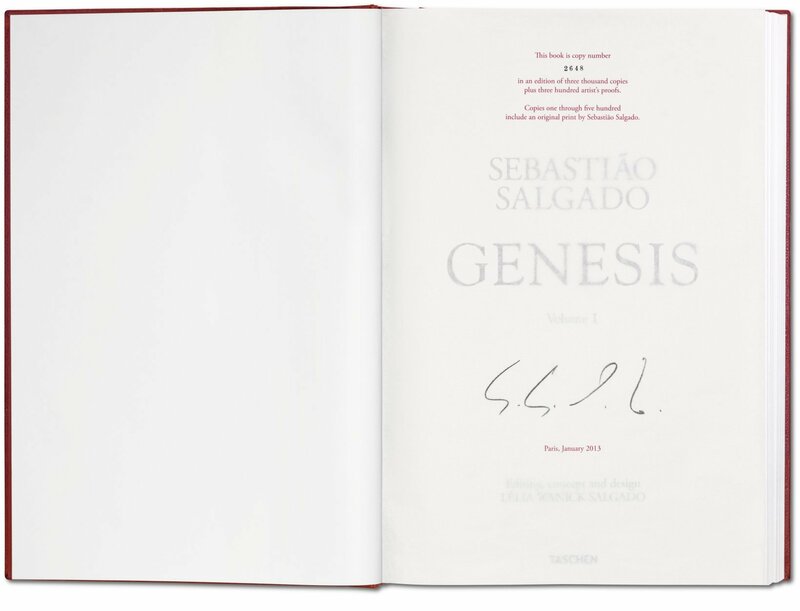 GENESIS is Sebastião Salgado’s love letter to the planet. It is the result of an epic eight-year expedition to rediscover the mountains, deserts, and oceans, the animals and peoples that have so far escaped the imprint of modern society—the land and life of a still pristine planet. 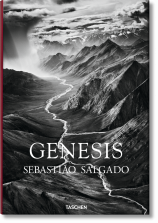 The GENESIS project, along with the Salgados’ Instituto Terra, is dedicated to showing the beauty of our planet, reversing the damage done to it, and preserving it for the future. 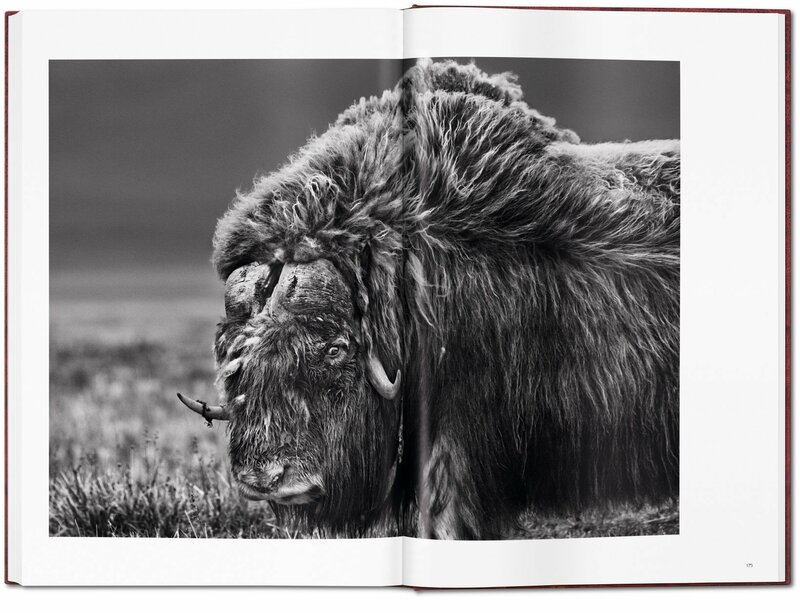 On over 30 trips—by foot, light aircraft, boats, canoes, and even balloons, through extreme temperatures and in sometimes dangerous conditions—Salgado has created a collection of images showing us nature, animals, and indigenous peoples in such intense beauty it takes our breath away. The reach is truly global. 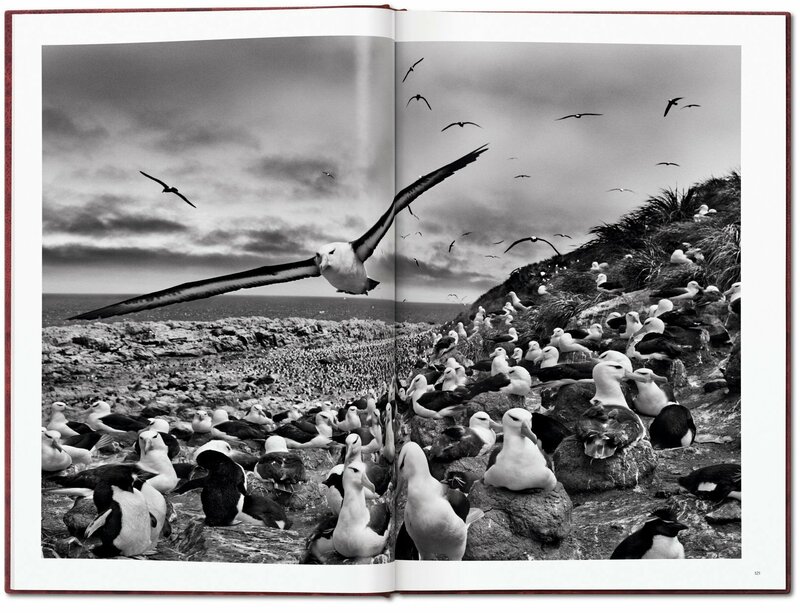 Through Salgado’s lens, one discovers the animal species and volcanoes of the Galápagos; the penguins, sea lions, cormorants, and whales of the South Atlantic; Brazilian alligators and jaguars; and African lions, leopards, and elephants. We travel over icebergs in the Antarctic, the volcanoes of Central Africa, the ravines of the Grand Canyon, and the glaciers of Alaska. We encounter the Stone Age Korowai people of West Papua, nomadic Dinka cattle farmers in Sudan, Nenets and their reindeer herds in the Arctic Circle, as well as the Mentawai jungle communities on islands west of Sumatra. 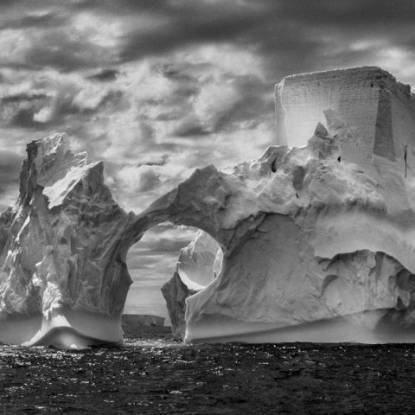 In characteristic monochrome, Salgado’s painterly notes are perfectly tuned to these sublime scenes, capturing sweeping aerial panoramas as much as the most intricate details and textures, from a reptilian skin to the fur coat of the Nenet people of northern Siberia. 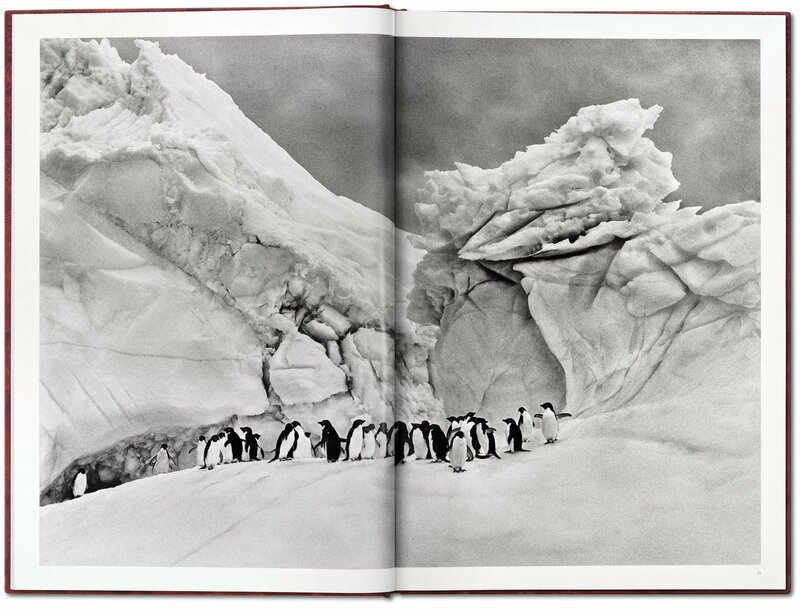 The exquisitely reproduced images are arranged not by theme but rather conceived as a journey around the globe, immersing them in Salgado’s vision of the Earth’s mesmerizing scale, order, and beauty. 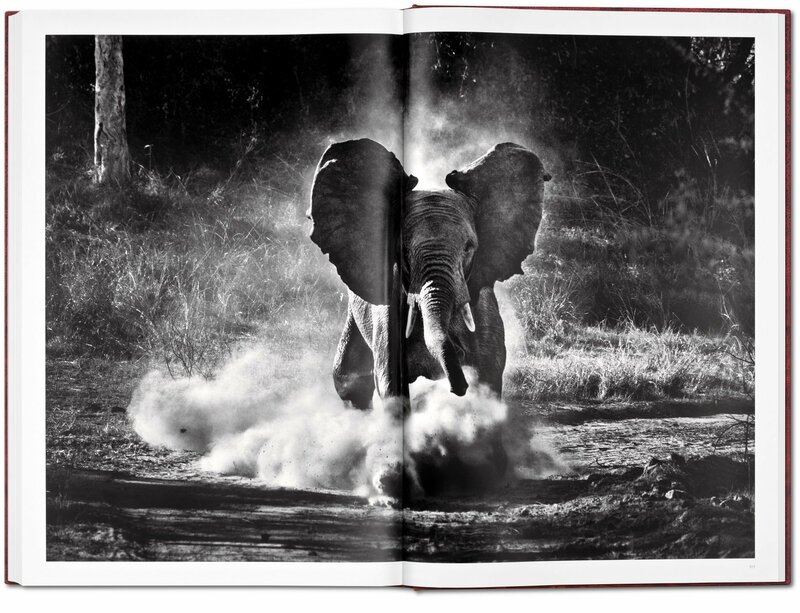 This two-volume SUMO-size Art Edition is designed and edited by Lélia Wanick Salgado and numbered and signed by Sebastião Salgado. 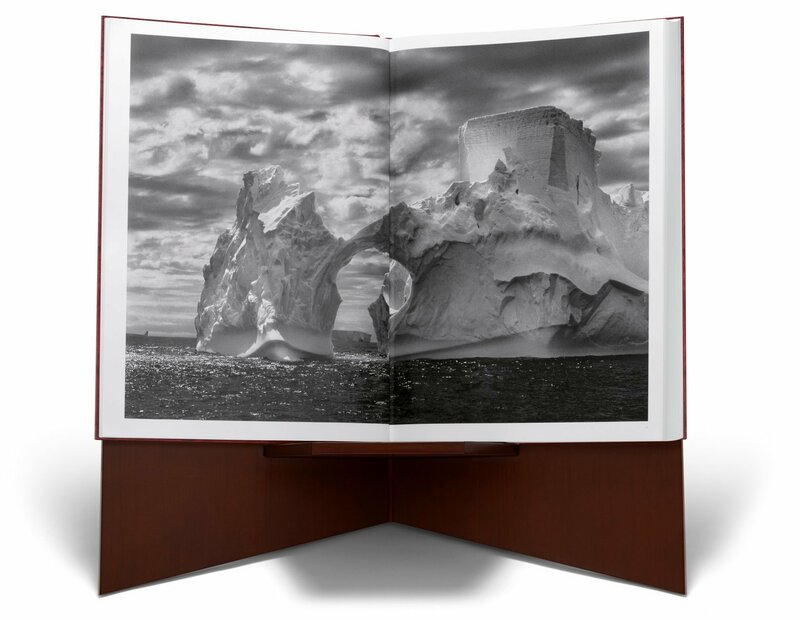 Leather-bound, it is presented with a bookstand in cherry wood veneer designed by Tadao Ando and a clothbound caption book explaining each stunning shot. Art Edition (No. 201–300), with a Tadao Ando bookstand and the print Black-Browed Albatrosses, Falkland Islands (2009), signed by Sebastião Salgado. 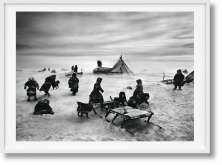 Also available in four other Art Editions of 100 copies each and in a signed Collector’s Edition of 2,500 copies (No. 501–3,000). 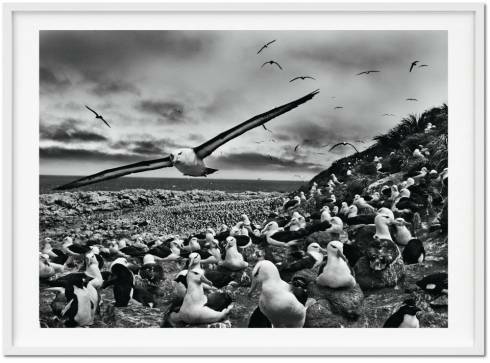 Sebastião Salgado began his career as a professional photographer in Paris in 1973 and subsequently worked with the photo agencies Sygma, Gamma, and Magnum Photos. 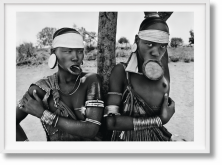 In 1994 he and his wife Lélia Wanick Salgado created Amazonas Images, which exclusively handles his work. 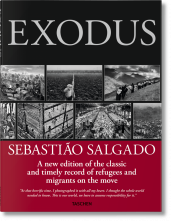 Salgado’s photographic projects have been featured in many exhibitions as well as books, including Sahel, L'Homme en détresse (1986), Other Americas (1986), Workers (1993), Terra (1997), Migrations (2000), The Children (2000), Africa (2007), Genesis (2013), The Scent of a Dream (2015), and Kuwait, A Desert on Fire (2016). Tadao Ando (born in 1941) is one of the world’s most renowned contemporary architects. At first a boxer, he decided to pursue architecture two years after graduating from high school. 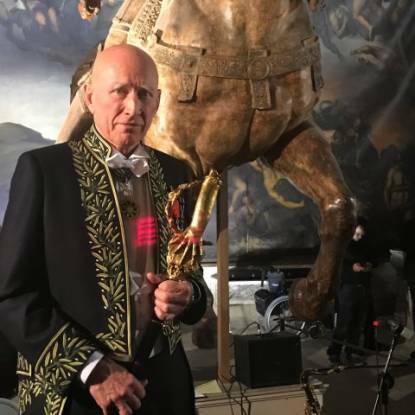 He is the only one to have won the discipline’s four most prestigious prizes: the Pritzker, Carlsberg, Praemium Imperiale, and Kyoto Prize. Ando currently works from his native Osaka.